The International Data Exchange Service (IDES) is a secure managed file transfer service that allows financial institutions and tax authorities to securely send information on financial accounts held by U.S. taxpayers in accordance with the Foreign Account Tax Compliance Act (FATCA). Files transmitted via IDES must be encrypted and packaged in accordance with published data preparation instructions. The data preparation process is an important step to ensure that information transmitted via IDES conforms to U.S security standards to safeguard sensitive information. The IDES Data Preparation OpenSSL project repository demonstrates the commands necessary to decrypt notifications downloaded from the IDES portal. The included commands are Windows specific, Linux specific, and a process that includes manual editing that will work for those and other systems. The sample commands are intended to be run from a batch file located along with the OpenSSL executable, the Key and Payload files from the notification, and the receiver's private key. Please note that there are many open market tools that produce the same results; however, the IRS does not endorse any commercial products, including the frameworks used in the example. The following code should be placed into a batch file and run in the same folder as the openssl executable. cbctest_public.pem - This will be the IRS Public Key for upload into IDES. A copy of this test key is included in the repository for testing these commands. The .p12 this was created from is included as well with a password of "password". A random 48 byte value will be created that will be used to create the AES key and the IV. The first command will encrypt the Payload and will use parsed values from the random 48 byte value. The second command will encrypt the 48 byte value that contains the AES key and the IV. The output from these commands will be the encrypted Payload and the encrypted Key file. cbctest_private.pem - This will be your private key that corresponds to the certificate that was uploaded into IDES. A copy of this test key is included in the repository for testing these commands. The .p12 this was created from is included as well with a password of "password". The first command will decrypt the 48 byte value which contains the AES key and the IV. The batch code will parse the hex values of the AES key and IV to prepare it for the second command. 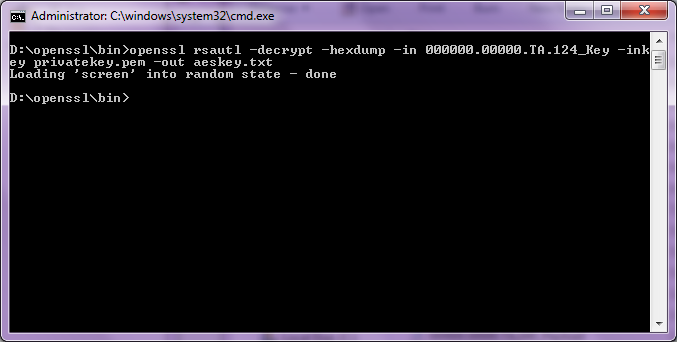 The second command will use the AES key and IV in hex format and decrypt the Payload file. 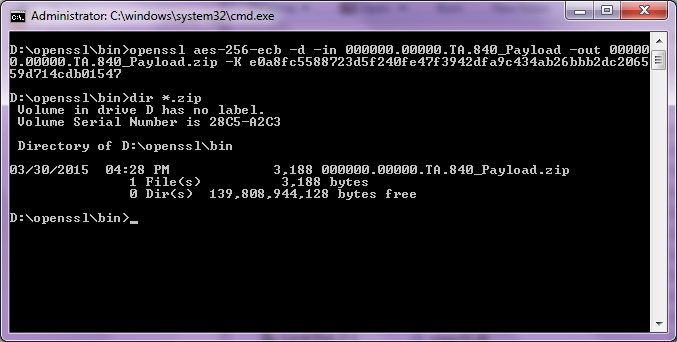 The output will be the decrypted Payload .zip file. Similar to the Windows method above, the following code should be placed into a shell script and run in the same folder as the openssl executable. --)  # End of all options. echo "pubkey=$PUBKEY infile=$INFILE aeskeyiv=$AESKEYIV outfile=$OUTFILE"
echo "Cipher text payload file=$OUTFILE and aes key file=$AESKEYIV created"
echo "privatekey=$PRIVATEKEY infile=$INFILE aeskeyiv=$AESKEYIV outfile=$OUTFILE"
echo "Plain text payload file=$OUTFILE created"
If you are having trouble with an automated method above, there are additional steps you can take to encrypt or decrypt the AES key, manually get the required hex key data, and use it to decrypt the Payload file. A random 48 byte value will be created and a hex version will also be created. Both the binary and hex values will be used. The following code should be run in the same folder as the openssl executable and necessary files. 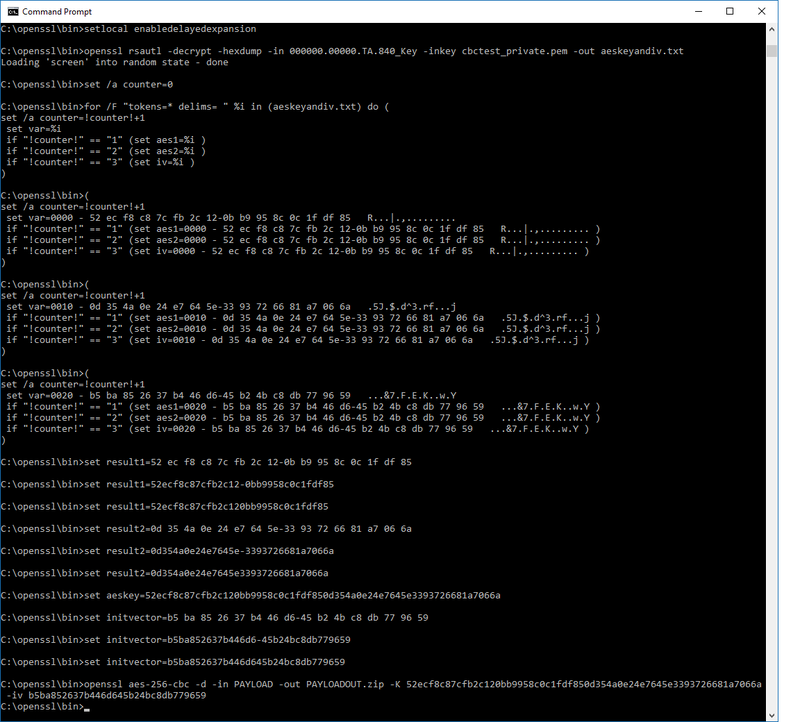 The hexdump flag in the command above will output the key in hexadecimal format which is needed to decrypt the Payload file. However, there is extra information that is included that needs to be removed before it can be used in the next command. You can use a text editor to open the 48byterandomvalue.txt file which is the output of the first command. The first two lines will become the AES key and the third line will become the IV. The hex content that is needed from the file is bolded below. The rest of the information needs to be removed. 39 71 72 82 33 B2 9E AB 2C 3A DD 29 92 4F 91 B1 // 9qr.3...,:.).O.. With the spaces and dashes removed and leftover characters together, the end result is a 64 character string and a 32 character string. The first string must be exactly 64 characters in length and will be the AES key. The second string must be exactly 32 characters in length and will be the IV. The first command to encrypt the Payload file can then be executed using the AES and IV hex values. The Payload file to be encrypted is needed as well as the two hex values. The second command to encrypt the 48 byte AES key and IV file can then be executed. This will use the initial 48 byte binary file that was created as well as the receiver's public key. The end result of these two commands are the encrypted Payload and Key files needed for the IDES data packet. The hexdump flag in the command above will output the key in hexadecimal format which is needed to decrypt the Payload file. However, there is extra information that is included that needs to be removed before it can be used in the next command. You can use a text editor to open the aeskeyandiv.txt file which is the output of the first command. There are three lines in the file. The first two are the AES key and the third is the IV. The hex content that is needed from the file is bolded below. The rest of the information needs to be removed. 0020 - 39 71 72 82 33 b2 9e ab-2c 3a dd 29 92 4f 91 b1 9qr.3...,:.).O.. With the beginning and ending information stripped out. The second command to decrypt the Payload file can then be executed using the AES key and the IV. The Payload file from the downloaded notification zip file is needed as well as the 64 character hex key string (AES key) and 32 character hex string (IV). This will decrypt the encrypted Payload file giving you the zip file which contains the XML Payload file. PLEASE NOTE: THE FOLLOWING SAMPLES ARE FOR ECB DECRYPTION ONLY. THESE ARE PROVIDED FOR LEGACY DECRYPTION AND WILL NOT BE COMPATIBLE WITH IDES AFTER JULY 9, 2016. The first command will decrypt the AES key. 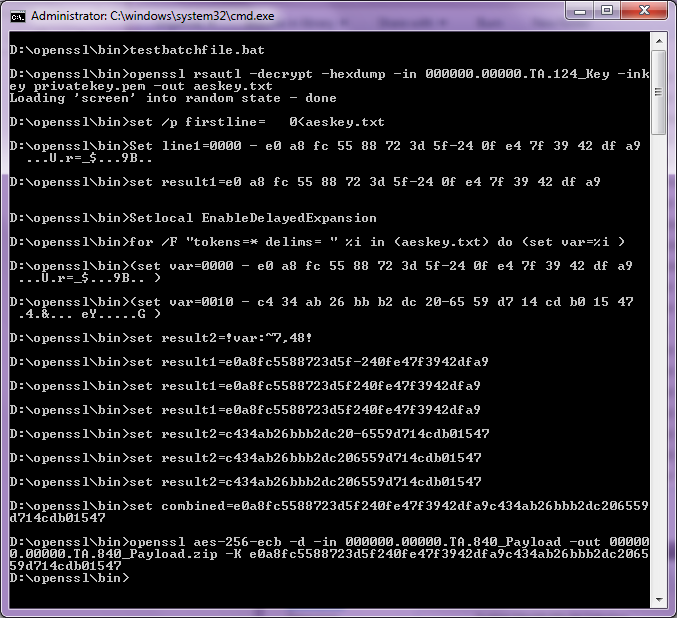 The batch code will parse the hex values of the AES key and prepare it for the second command. 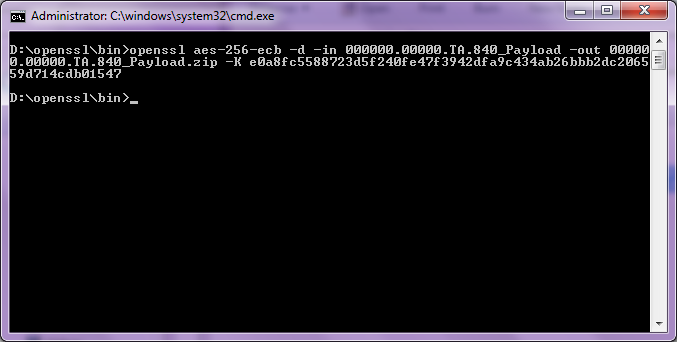 The second command will use the AES key in hex format and decrypt the Payload file. The output will be the decrypted Payload .zip file. Similar to the Windows method above, the following code should be placed into a shell script and run in the same folder as the openssl executable. However, this script will use the cut command to prepare the hex data. If you are having trouble with an automated method above, there are additional steps you can take to decrypt the AES key, manually get the required hex key data, and use it to decrypt the Payload file. The hexdump flag in the command above will output the key in hexadecimal format which is needed to decrypt the Payload file. However, there is extra information that is included that needs to be removed before it can be used in the next command. You can use a text editor to open the aeskey.txt file which is the output of the first command. The hex content that is needed from the file is bolded below. The rest of the information needs to be removed. 0000 - e0 a8 fc 55 88 72 3d 5f-24 0f e4 7f 39 42 df a9 ...U.r=_$...9B.. 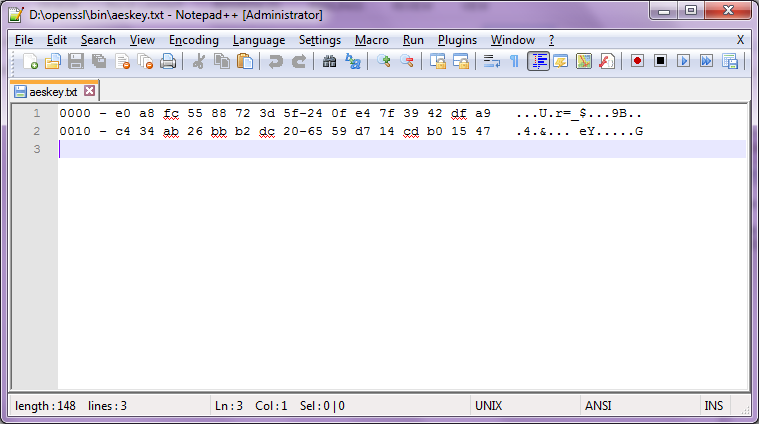 The second command to decrypt the Payload file can then be executed using the 64 character hex key string. 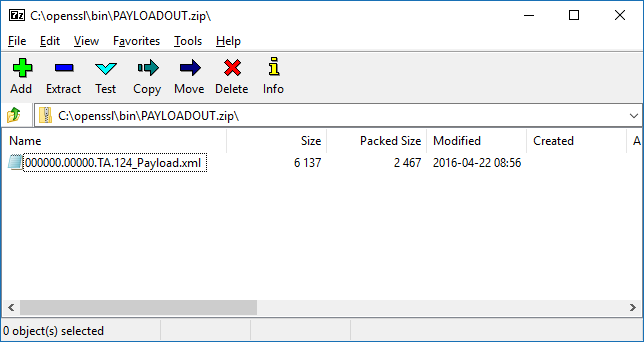 The Payload file from the downloaded notification zip file is needed as well as the 64 character hex key string. We waive copyright and related rights in the work worldwide through the CC0 1.0 Universal public domain dedication. Unless expressly stated otherwise, the person who associated a work with this deed makes no warranties about the work, and disclaims liability for all uses of the work, to the fullest extent permitted by applicable law. When using or citing the work, you should not imply endorsement by the author or the affirmer.